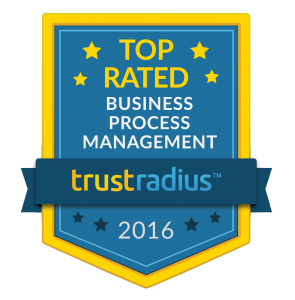 Bothell, WA – April 14, 2016 – Winshuttle is proud to announce that it has been recognized as the highest 2016 top rated Business Process Management Software by users on TrustRadius, a business technology review site. TrustRadius analyzed hundreds of in-depth user reviews and ratings to determine the top vendors in each category for 2016. “We are honored to be a top rated software by TrustRadius users, as it exemplifies our dedication to provide innovative solutions and illustrates the trust our customers have in our products,” said Lewis Carpenter, Chief Executive Officer of Winshuttle. TrustRadius describes BPM software as products that allow non-technical users to build workflows and manage their own processes, improving business agility and reducing the burden on IT resources. Site reviewers note that Winshuttle accomplishes all that and much more. “Winshuttle software has been highly recommended for automating core SAP processes to improve workflow and efficiency,” said Megan Headley, Research Director at TrustRadius. “Users mentioned the product’s ease of use and versatility as strengths,” she said. Winshuttle has an 8.8 out of 10 rating on TrustRadius, demonstrating their commitment to customer satisfaction and continuous improvement. User feedback was recently utilized from over 500 customer interviews in development of their latest Version 11 software release.